If you haven't noticed yet, Windows Phone 7.5, codenamed "Mango", has been out for a while. However, you might have noticed that compared to Android or iOS, Windows Phone hasn't been given much love when it comes to development for it. It's sad because Windows Phone is a platform that delivers. However, you can change that. Windows Phone needs new developers and new programs to help it to grow and mature. If you have been thinking about developing for Windows Phone, but haven't done it yet, now is the time. If you are new programmer, this is a good time for you to get your program ideas out there and established in the world of technology. Windows Phone mainly uses Silverlight for graphical user interfaces. Silverlight is similar to html, so if you've done any html coding, you should have some idea of how some things works since the structure of XAML, which is the markup language that Silverlight uses, is similar to html. For the internal guts of the program, you use either C# or Visual Basic. If you've programmed in Java before, the concepts are mostly the same, with a few minor differences between java and C#. It is possible to use C# (or Visual Basic) for modifying the graphical user interface of your program in addition to Silverlight. This is useful for situations such as adding components to the user interface on the fly. To give you an incentive to develop for Windows Phone, Microsoft has launched the APPortunity Contest. You could win one of five Samsung tablets. 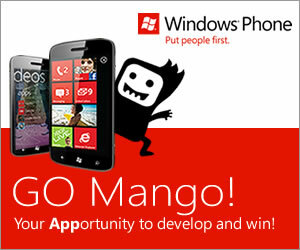 Each time you publish a program to the Windows Phone Marketplace (for Mango), you get an entry into the contest. If you publish 5 programs to the marketplace during the contest, you get FREE ADVERTISING for ANY program of YOUR CHOICE. The free advertising will run on the Windows Phone Application Network for around 60 days and includes 25,000 impressions. This contest runs from Now to December 31, 2011. There are more details in this contest to come. To help you stay tuned for further announcements, you can subscribe to my rss feed or follow me on twitter (username is @rctechgeek). 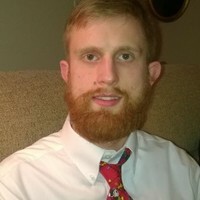 Update (1-14-2011): I have some important updates to the contest that you will like, especially with students. The link that was here is currently down, but I will have it up in an hour or so. Update (1-21-2011): I have finally fixed the page with some contest updates that was messed up. You can see the update here. The much awaited Mango update for Windows Phone is out. With this new update, many new features have been added. However, is Mango really better than its predecessor? Since most of us have all had a chance to play with mango for a bit, let's see which is better. The first part is probably the most important, the Phone. If this part is horrible, than what is the point of getting the "phone" anyway? Microsoft has added a search feature that lets you search your call history. The sad thing about this is that you can only search by contact name and not by phone number. Nothing else really needs to be added to this, except for fixing the search to include search for phone #. The second part I will cover is the web browser, Internet Explorer. Microsoft has moved the url bar from the top to the bottom of the layout. At the same time, a consequence of this is that the features that were buttons at the bottom of the screen have been hidden under menu. In order to get to your tabs, you have to open up the menu and then choose the "tabs" menu item from the menu, but the good news is that you don't have to be in just portrait mode anymore to find the tabs option. The same treatment given to tabs has also been given to the "favorites" and "add to favorites" as well. On the plus side, Internet Explorer mobile now has hardware-accelerated browsing. Another thing where I think Microsoft went wrong was the elimination of the forward button for mango, so you can only go back in web navigation, not forward. The third part is Contacts. A big feature added with Mango is the ability to create groups of your contacts so you can organize your contacts better. Search has also been added so you can search your contacts for someone. The fourth part is e-mail. Not much has changed here. For the buttons at the bottom, the folders button has been taken away. Searching e-mail has also been more apparent for those with phones lacking a physical keyboard. As far as the calendar goes, it really hasn't changed. The marketplace has also changed. When you bring up an program in the marketplace, instead of having all of the information about the program, like the overall rating, program description, reviews, and screenshots, all on one page, everything is now in "tabs", meaning organization is better. Marketplace search has moved from pressing the search button, to a button in the menu bar. In mango, if you are in marketplace, and you press the search button, you will get the normal bing search screen. Music and video has definitely received a change. The buttons that control playback are now larger. Repeat and shuffle buttons have been made more obvious by appearing to the side of the album art instead of having to tap the album art and then pressing the repeat and/or shuffle buttons. Now, you can create playlists from what's in your now playing list. However, there is a catch. You cannot move items in a playlist around to a different position. This can be a bother when you add a whole album or all of an artist's songs to a playlist, but you want to change the order that those songs are in. If you have the youtube plugin installed, the youtube site interface has changed for the better. However, youtube videos are no longer shown in the media player history. Fortunately, I intend to correct many of these ills when I release the media player program that I am working on right now, Mobile Media Manager (it's not in the marketplace yet, but there will be an announcement when it has been put on the marketplace). For Microsoft Office, one of the biggest changes is the ability to (finally) edit documents, spreadsheets, and powerpoint presentations saved on your skydrive account. So if you want to work on a word document on your phone that is stored on your laptop's hard drive, all you have to do is upload your word document to your skydrive account. I might add that in order to edit a document from your skydrive, it must be in it's xml document format. In other words, either .docx, .xlsx, or .pptx, the default formats for Microsoft Office documents since Office 2007. If it's in Office 2003 or earlier format, like .doc, .xls, or .ppt, you can still open and view the file, but you have to save it as its xml document format before you can edit it on the phone. In pictures, access to your photos taken with the phone's camera is right on the start screen when you access pictures, instead of going to your picture albums, and then selecting "camera roll". In Xbox Live, there is now an option for you to get gold level access if you currently have silver level access (which is free). I do not know for sure, but I have a hunch that Microsoft will eventually build features into Xbox Live on windows phone that only gold level members can access. In messaging, Microsoft has built Windows Live Messenger support into mango, so you can now chat with your windows live messenger buddies right from your windows phone. In Maps, you now have landscape mode in addition to portrait mode. The maps program has a new feature that allows you to find nearby businesses (like restaurants) and nearby attractions. I can certainly see this as being handy while on the road or on vacation somewhere. And last in my article is the settings. Things here are mostly the same. In the settings screen for the switch for your cellular data connection, if you're in airplane mode and you try to turn your cellular data connection on, you will be asked if you want to want to turn airplane mode off or not. The biggest new feature in settings is the Battery Saver. If this is enabled, it disables some services such as push e-mail and programs being able to run in the background. You have the option to enable battery saver to run now, or to run when the battery is low (and yes, you can disable battery saver mode if the phone currently has battery saver enabled). Another big feature is the ability for programs to run in the background (if the program supports it). For wi-fi, you can now see a list of all the routers your phone has connected to. To close it off, Windows Phone finally gets multitasking. The way this works is if you are in a program, press the start menu button to go back to the start menu, and open up a second program from there, you can go back to the first program by holding the back button and then swiping left or right with your finger until you get back to the program you want. So overall, I do think that mango is worth the update and is better than nodo. Microsoft did do a good job with it as far as updates and new additions go. However, it's still missing a few things like bluetooth keyboard support and bluetooth a2dp audio streaming support for videos as well as audio (a2dp audio streaming for video was available on windows media mobile in Windows Phone 6.5, so it is possible). As a programmer, I also wish that Microsoft would open up the SongCollection, Playlist, MediaQueue classes (and any other similar classes) so that those of us who are programmers (like myself) can make custom playlists in our programs. If you have any questions or comments, I would love to hear them. You can either use the comment box or send them to me via e-mail at catholictechgeek@gmail.com, and I will answer any e-mail I get at the end of my next article. You can also follow me on Twitter (username is @rctechgeek).